Auriga (the Charioteer) rises, with north to the left. . Capella is the bright star toward upper left. The three "Kids" (clockwise from left, Almaaz, Haedus I and Haedus II) are just up and to the right of Capella. The star to the right of center, a part of the figure of Auriga, is Elnath, and is also one of the horns of the constellation Taurus. The star is both Beta Tauri and Gamma Aurigae. It is formally within the boundary of Taurus, however, so the name "Gamma Aurigae" is not used. 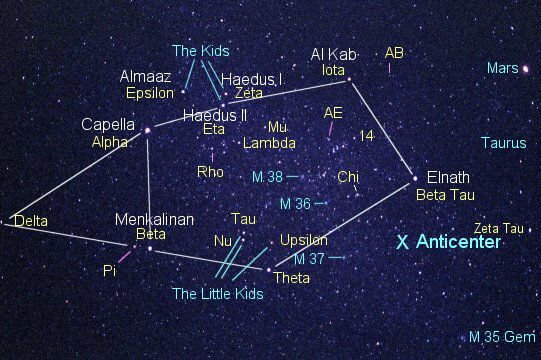 Menkalinan, Beta Aurigae, is the bright star down from Capella, while Al Kab (Iota Aur) is to the right of the Kids. Theta Aurigae lies at the bottom of the pentagon that makes the figure. The "runaway star" AE Aur is just above the string of stars that lies to the right inside the pentagon that outlines the constellation. The open clusters M 38, M 36, and M 37 run in a line from the center toward lower right. In the bottom right-hand corner is the fuzzy patch that makes M 35 in Gemini. The Milky Way glows faintly from top center to lower right. The bright "star" to upper right is Mars.